Another final and yet another title for the GOAT as he scored a 6-3 7-6(11) victory over Pablo Cuevas in the inaugural TEB BNP Paribas Istanbul Open. The win means Roger now has 85 career titles across 19 different countries on the ATP Tour. 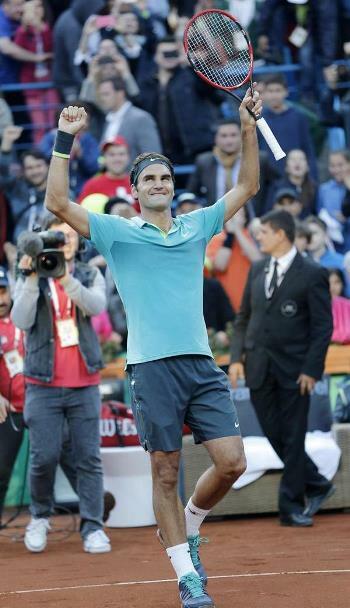 The victory also sees the Swiss win his first title on red clay since the 2009 French Open and he delivered exactly what the tournament organisers and home fans were hoping for; kicking off the Istanbul Open with a bang so that it can remain a fixture on the ATP Calendar for 2016. Federer opened things up with a love hold and then broke the nervy Cuevas in his opening service game before quickly consolidating to take a 3-0 lead. A great start for the Swiss against an opponent he'd never faced before. The one break proved decisive and although Roger got pegged back to deuce at 5-3 he held serve to take the opener 6 games to 3 without running into any difficulty on serve. Into set 2 and Cuevas steadied the ship on his own serve and both players exchanged back to back holds. At 3 all Roger made his first inroads on the Cuevas serve and comprehensively broke to love. I thought at that point it was all over but Roger delivered a slack service game to get broken back immediately. The Swiss then had a chance to re-break, reeling off three genius points in a row to create 0-40 but Cuevas saved them all before holding for 5-4. Roger then reeled off two love service games in a row to force a tie break. The tie break was one of the craziest I've seen in a while with both players having chances to win it but playing tentatively when the opportunity presented itself. Roger was the first to hold match points, moving into a 6-4 lead courtesy of a flukey return that crept over the net. However he couldn't capitalise as Cuevas levelled for 6 all, only to double fault himself and give Roger his third match point. On this one he missed a simple backhand slice dropshot and then blazed a forehand long to fall 7-8 behind. Cuevas decided to make a serve and volley play but dumped the volley into the bottom of the net. Fed then had his fourth match point at 9-8 but again failed to convert, losing both points on serve and having to save his second set point with a brilliant backhand down the line return winner. At 10-11 Roger faced another set point but with 2 serves in hand he came up with a great play to level at 11-11 and then played a majestic volley deep into Urguayan's backhand corner to setup his fifth match point which he finally converted after a string of powerfully hit forehands. A very good week for Federer here and he delivered the title which lets face it everyone expected him to win. It might only be an ATP 250 but he was playing with a fair bit of pressure on his shoulders – he probably thought he should win it himself, the tournament organisers will most definitely have wanted him to at least make the final and the both Fed fans at home and in the stadium were hungry for a clay court trophy. Luckily after two hard fought three sets victories the final was a much easier matchup for Fed and apart from the unnecessary drama in the second set he was able to play the match on his terms and the result was never really in doubt. Very pleasing to see him continue to move well and hold up physically after back to back to back three setters too. I didn't know much about Cuevas before the final but it was apparent from the first few games he doesn't really possess the style to cause Roger too many problems; his forehand isn't a weapon and Roger handled his backhand easily from the back of the court. His return of serve wasn't an asset either and Fed got plenty of free points on serve. Cuevas of course hits a decent ball hence the ranking of #23 but you need a little bit more than that to make it competitive against the top 10. The Uruguayan did however do well to recover the break in the second set and showed some good fighting spirit in the breaker, in fact he should have won it if he was able to show a bit more composure but Federer made him play one more ball and he missed it. Roger himself should have got the job done earlier though, hitting a few tight shots on the match points to let Cuevas back into it. I'm happy he got it done in straights though as it means that little bit extra recovery time for Madrid. Fed will play his first match on Wednesday against either Gimeno-Traver again or Kyrgios who lost the final to Gasquet in Estoril. Winning the Istanbul final should be a pretty good confidence boost for Fed so I hope he can keep up the form heading into a tournament where he usually plays well. Allez! Very good display in the final despite a couple of wobbles in the 2nd set. First red clay title since 2009 so a very overdue win on this surface. Next stop Madrid! The tie break was fun, two guys clowning up on some of the bigger points but Fed got it together at 11-11 to pull of that volley. my comment is still awaiting moderation? Yeah you put a different email in so I had to manually approve it 🙂 no harm done though, the timestamp is from when you posted it, not when I approved it. Wow. GREAT to get an individual title on the red stuff – though not forgetting some awesome play in the DC final last year. Great to have beaten some clay court specialists – granted, not as highly ranked as some he may face next week, but it’s not like any of them handed him a win either after Niemenen. He’s got some solid clay practice this week. Last year after he made the MC final he didn’t do much of anything else on clay, but that was right when Leo & Lenny were born. This year he’ll have a 1st birthday part to attend but that should be less stressful! Madrid often goes well for him, so fingers crossed. May 6th I think they were born, so their 1st birthday will be on Wednesday when he plays his first match. No family went to Istanbul so surely they’ll be meeting up in Madrid. I think Cuevas had cramp in his forearm or something. Didn’t seem to effect him too much after the MTO. Closing out matches is hard even for the best players, the toughest thing to do for players at all levels. Really great week, enjoyed watching all his matches. I quite like Schwartzman, as a short guy myself it was good to see how you don’t need to be 6 foot plus to give the maestro a good match! The final was probably his best performance too so good signs for Madrid. He’s the number 1 seed at a masters event for the first time since Shanghai 2012! Couldn’t agree more. You can be short, have no talent, just rely on dope and endurance, run all day, and play fetch ball, and give the most talented player ever in the history of tennis a run for his money. Haha Sid are you Anti-Schwartzman now too? Yeah maybe the MTO did break his rhythm. It can change the psychology of the match when you think your opponent is ‘injured’. That’s why some players choose to rope a dope or take tactical MTO’s to help them win. Thought it was going to be all plain sailing when I first tuned in and he’d just taken the first set. Then he was up a break in the 2nd, and I thought: “That should do it”. Boy, was I wrong! I kept checking in to see if he’d won the TB, and no joy. Fully expected that if he lost it he might lose his serve straight after and then struggle, but thankfully not. I thought it was all over when he went up a break. Cuevas looked finished. As Jonathan said earlier, titles on the red dirt are hard to come by! Note his last clay title was on the blue stuff in Madrid!! 2012? Anyway, vv happy with Fed! Huge pressure whatever they say! New tourney so pressure from ATP/sponsors/tourney directors/fans! And he delivered 100% (so doesn’t need to go back)! Pity Grigor didn’t keep his side of the bargain! Quavers has zero personality!! Liked the Mario comparison btw! Best shot of the match? That BHDTL at set point down in the TB! Haven’t seen that since 2008 Wimbledon final at match point down in TB v Nadal!! His game has moved away so much from clay so this was a good victory! Any run of wins against any oppo gives confidence and Fed thrives on confidence! Turkey King! Now let’s hv Churros King!! Yup Madrid 2012. I have seen some fans complaining about omitting Madrid and talking about red clay. But it is factual. Madrid is obviously the last clay title, but red was 2009. Dunno about the no personality thing. I didn’t listen to the trophy presentation but perhaps just language barrier. Early on Del Potro wasn’t that personable either. I saw Cuevas put out some complimentary tweets afterwards saying he would cherish playing against Fed etc. There were 4 or 5 shots of the match – the 3 points in a row for 0-40 (similar to against Djokovic earlier this year where he again failed to break), the BHDT and then the shoelace volley. Not a technical term, just the fact the ball was virtually on his shoelaces when he made contact with it, very low. Oh boy, this is a very pleasing. Roger hung tough throughout the week, beating four guys who were all good playing on red dirt. Agree completely with your summary, Jonathan. Nevertheless, I thought that not converting any of the double and triple BPs in the 2nd set was a bit strange, was Roger sitting back waiting for Cuevas to faulter? The TB was absolutely crazy. The fact that Roger came through just showed that Roger was confident. Agree with Susie that the 2nd point from the last of the match was an absolute beauty – the more the better! Carrying this Turtish Delight to Madrid could only be a good oman. Totally agree on that….how many he wasted in French Open…if someone has stat on that likely that Roger has same no.of BP as Dull…though conversion is different story..
Hi JOnathan, there was i thinking it could all be over in an hour or less how wrong can you be. To say i was yelling at my computer screen during the tie break is an under statement. Pleased he got the job done, still worryabout the number of break points he squanders but that said onward and upward. Tough draw in madrid but hopefully he will be full of confidence. Don’t you just love this game called tennis, especially when the Turkey king is playing, sounds like the name of a hamburger !!! Love all your write ups Jonathan you work so hard for us fed fans. I like how the Turkish announcer was calling Fed “Majesty”. Just amazed. He’s so freaking awesome to be able to live up to the expectations from the whole world again and again. The happy 85th title in the end, and it’s on red clay! …despite the most bizarre TB he ever played in my memory. How many times did I facepalm? Nice to know it was a fun for him. Yeah the tie break was kinda up there with the Mayer match in Shanghai for drama! Yeah like I put in my previous post it’s still tough to see Fed been a real threat on clay. A very tough surface for his game / age. I think it’s all good as long as he builds some momentum towards the grass which he has effectively done by winning a title on clay. Good ending after a few tough matches, hope this helps his confidence and rhythm going to Madrid. Its such a brutal draw and little rest time. Hope he can at least go deep. First match Wednesday, so it’s not too bad, 3 days off virutally. 4 hour flight or so he could fly this morning, rest Monday, light practice Tuesday and good to go. Oyun, set, ve mac. Federer sampiyon! Just watched the bester one more time. You guys think that the backhand return winner on set point was the best point of the tie break. I think the shoe lace volley two points later was better. The impudence to serve and volley in that situation, and make that kind of volley? For me the BDTL was the best by far. Off a great wide serve and that fact that it just cleared the net by millimetres showcases the riskiness of that shot! 10-9 for Pablo and the point which gave Roger the 10-10?? Was that that point?? Because if you guys mean another point… please look up that point with which Roger equalled 10-10. Goat…. LOVED absolutely LOVED that point. He should have lost it and it would have gone to a 3rd set, but Goat had other plans. I have watched that point a total of 10 times. Love it 🙂 Do you guys mean that point?? Yeah it was the point at 9-10 Katyani, clean ripped backhand return winner. Cuevas looked stunned. @Sid that volley was insane, if it landed anywhere else in the court Cuevas has a chance to make the passing shot but smack bang in the corner and he can only get a flimsy racquet on it, had a look of disbelief on his face. I think it is a close call between which is better, that backhand was a ridiculous shot down set point too. I would probably pick the volley as the BH was a reaction type shot, the shoe lace volley took an awful lot of skill to execute. Precisely! The BHDTL was part guess work, it was risky, it’s one of those things you happen to do subconsciously. The volley? Goodness me. There was too much he did in that short time, serving, running in, split step, watching the sliced return float, then die, sail out of reach, crossing over the right foot, the slide, bending as deep as he possibly could have, picking the ball up millimeters from the turf, getting it over the net, all the way, diagonally, deep into the corner. There are so many things that happened there. You can make a case that the BHDTL was on set point, and carried more meaning. But in a tiebreak that goes 13-11, which point isn’t meaningful? Wow, that’s Sid at his best! Those pesky clay titles are hard to get these days aren’t they? so definitely celebrating this one. Was unable to keep up with the happenings of Istanbul but seems as Fed won ugly to get to the trophy. Roger has a pretty tough road to the final in Madrid so I’m not sure this title will aid his confidence but rather provide one of relief. To be honest, i see anything that happens from here on out preparation for Wimbledon, Fed winning Madrid would be extremely impressive and things can click if he is able to take advantage of Djoker’s absence and Rafa’s “slump”. First round match looks intriguing with Kyrgios, robbed of that one in Melbourne. Anyway, it looked like the week went as planned with Istanbul establishing itself on the tour and Roger winning was the icing on the cake. Thanks for the great summaries J, hoping for a good run in Spain. I think it will add a lot of confidence to his game. Winning titles is a big deal regardless of stature of the event. Kyrgios isn’t a given to come through, we saw from Istanbul Gimeno-Traver can play well on clay. Might be able to move Nick around a bit too much. Hyperbole of course, but only Fed makes clay-court tennis worth watching. Turkish Delight. Hey Murli, great to see/hear/read you, been a while! That was super funny. Good one!! Thanks Murli, this is cool :). The second set was child’s play 🙂 Fed had a set lead, even if it went 3 he was unlikely to lose. Thanks for the posts, Jonathan. 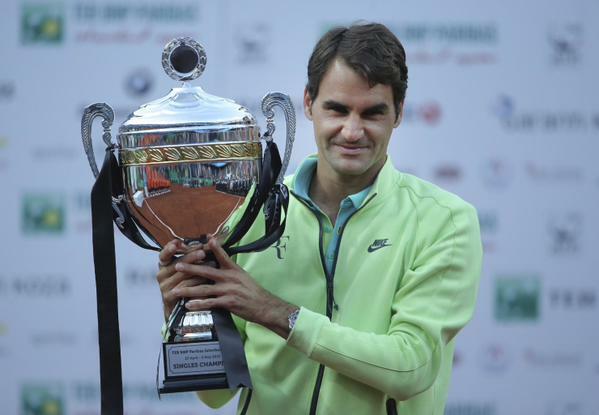 I was not able to see too much of this tournament but so glad to see our man holding the trophy. Yes, I suppose it will be a big birthday party in Madrid for the twins. Can’t believe it’s been a year already since their birth. Nice to see Fed’s name at the top of the draw! Almost 34yo, amazing really. Thanks Wanda / Katyani / Gaurav / Gang for the appreciation – More lyrics than poetry and that too a rip-off of a famous song by Doris Day of whom Fed might not even heard of, Jonathan. But Shawarma is Turkish, so there. Unfortunately the whole tournament was not televised so was following live on the net. Saw highlights the next day. Fed can make claycourt tennis palatable as he plays normally and not the drab way the typical claycourters play. Waiting for the clay season to end actually. But still as long as Fed is there, I am there, clay notwithstanding. Fed is in good nick but Nick ain’t.